My travel agent had told me that the only direct flight to Muscat yesterday was KLM. I arrived at my gate and saw an Oman Air flight parked at the gate next door. It was bound for Muscat and even taking off a few minutes before the KLM flight! While waiting for my blood pressure to drop back to 3 and 2 digits, I asked the suit by the gate entrance, and he assured me that I had made a better choice. The Oman air flight stops at Dubai on the way! 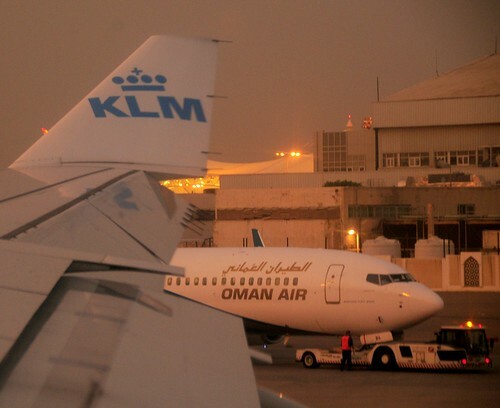 The national carrier of Oman doesn't have direct flight to Muscat from Kuwait - but the Royal Dutch Airlines does. Crazy world! The KLM flight is a hoot - it goes Amsterdam - Kuwait - Muskat - Kuwait - Amsterdam. I often take it, and find myself sitting with Omani families.